Hepatitone is a powerful supplement for liver diseases like Hepatitis, Cirrhosis. The liver shoulders a heavy workload for the body and almost never complains. It even has a remarkable power to regenerate itself. Still it should not be taken for granted. Certain conditions that develop, such as fatty liver and steatohepatitis, may be signs of liver injury that can lead to permanent liver damage. The term viral hepatitis is usually used to describe infections caused by agents whose primary tissue tropism is the liver. To date, at least five hepatitis viruses have been recognized, and these have been named:-Hepatitis A, B, C, D and E. Acute hepatitis may also occur as part of the clinical course of a number of viral infections, including human cytomegalovirus, Epstein-Barr virus, herpes simplex virus, yellow fever virus and rubella. The majority of infections are totally asymptomatic, but common clinical features include: anorexia, nausea, vomiting, right upper quadrant pain and raised liver enzymes AST and ALT. Jaundice is the hall mark of infection, but tends to develop late. Hepatitis virus A and E are infected through oral route (food and drinks) and B, C, D are through parenteral route - e.g. injections, blood transfusion, sexual, tattooing, acupuncture. Hepatitis B is the only DNA genome virus particle and all others are RNA only. Hepatitis B is dangerous as it can lead to cancer of liver (hepatocellular carcinoma). Epidemic or endemic type of jaundice is caused by either A or E. One hepatitis G has been reported from the blood of a surgeon but not widely reported. In enteric types, the viral particles multiply in the intestines and later reach liver where it enters hepatocytes and produce inflammation causing liver to swell. Mild fever could be there initially with body pain. Later develops jaundice. In parenteral types, viral particles reach blood and produce viremia with symptoms. Further enters hepatocytes to produce jaundice and later it leads to severe liver damage and even liver failure and death. Carrier state is there who are prone to spread the infection through parenteral route. Various vaccines are developed now to prevent this dreadful disease. Serum vaccines and recombinant DNA technology (yeast) HBsAg vaccines. Fatty liver is just what its name suggests: the build-up of fat in the liver cells. Although this is not a normal condition, fat in the liver usually causes no damage by itself. However, on some occasions it can be a sign that other more harmful conditions are progressing. Fatty liver may be associated with or may lead to inflammation of the liver. Cause It would seem logical that eating fatty foods would cause a fatty liver, but this is not the case. The liver does play an important role in the metabolism or breakdown of fats. Something goes wrong in this process of metabolism, but it is still not known what causes fat to build-up in the liver. It is known that fat accumulates in the liver with a number of conditions. The most common is obesity. 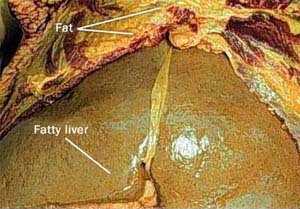 Fatty liver is also associated with diabetes mellitus, high blood triglycerides, and the heavy use of alcohol. It may occur with certain illnesses such as tuberculosis and malnutrition, intestinal bypass surgery for obesity, excess vitamin A in the body, or the use of certain drugs such as valproic acid and corticosteroids. Sometimes fatty liver occurs as a complication of pregnancy. Symptoms and Diagnosis There are usually no symptoms that are noticeable to the patient. In fact, fatty liver is frequently uncovered during a routine physical examination. There may be a rise in certain liver enzymes found in the blood, and sometimes the liver is slightly enlarged. Fatty liver may also be discovered while the physician is evaluating a patient for other illnesses. For example, an ultrasound scan of the abdomen done for other reasons may show fat in the liver. To be certain of a diagnosis of fatty liver, the physician may recommend a liver biopsy. Under local anesthesia, a slender needle is inserted through the right lower chest. A small piece of liver tissue is taken out with the needle and examined under a microscope. When the scar tissue as a result of inflammation (hepatitis) in liver replaces normal and healthy tissue, blocking the flow of blood through this organ and preventing it from working as it should, is called Cirrhosis of liver. Cirrhosis is most commonly caused by alcoholism and hepatitis C, and was the 12th leading cause of death in the United States in 2000, killing about 26,000 people each year. Alcoholic Cirrhosis is the leading common type leading to fatal liver failure. Causes Cirrhosis has many causes. In the United States, chronic alcoholism and hepatitis C are the most common ones. Symptoms Many people with cirrhosis have no symptoms in the early stages of the disease. However, as scar tissue replaces healthy cells, liver function starts to fail and a person may experience the following symptoms: exhaustion, fatigue, loss of appetite, nausea, weakness, weight loss, abdominal pain, spider-like blood vessels (spider angiomas) that develop on the skin. As the disease progresses, complications may develop. In some people, these may be the first signs of the disease. Complications of Cirrhosis Loss of liver function affects the body in many ways. Following are the common problems, or complications, caused by cirrhosis. Edema and ascites, Bruising and bleeding, Jaundice, Itching, Gallstones, Toxins in the blood or brain, Portal hypertension, Varices, Insulin resistance and type 2 diabetes, Liver cancer and Problems in other organs. This Herbal supplement contains five herbs designed to help exclusively for liver diseases. Man has only one liver unlike pair of kidneys and lungs. Liver has the unique significance as the seat of metabolism and detoxification. All food, beverages and medications go to liver first after absorbed from stomach. A healthy liver function is mandatory behind a healthy wellness state. For Adults 18 yrs or older, take two (1) Capsule two times daily (every 12 hours) on empty stomach with lukewarm water. For best results, no food should be taken 30 minutes before or after taking Hepatitone. Phyllanthus Amarus - Phyllanthus Amarus belongs to the family Euphorbiaceae is a small herb is a broad spectrum medicinal plant that has received worldwide recognition. The phytochemical analysis of the Phyllanthus Amarus extract confirmed the presence of tannins, saponins, flavonoids, and alkaloids. The plant extract has been found to contain high levels of saponins, tannins, flavonoids, and alkaloids. The plants of the genus Phyllanthus are widely distributed in most tropical and subtropical countries and have long been used in traditional medicine to treat chronic liver disease, anti-diabetic, Dysentery, Genitourinary system, Wounds, Ulcers, Kidney stones, and Spleen. The plant shows marked anti-hepatitis B virus surface antigen activity in in-vivo and in-vitro lab studies. Silybum Marianum - Silybum Marianum has been used for over 4,000 years. Silybum Marianum is native to the Mediterranean region. The Greek physician and botanist Dioscorides was the first to describe Silybum Marianum's healing properties in the year 40 A.D. One of the active ingredients in Silybum Marianum is silymarin, which is extracted from the plant's seeds. Silybum Marianum benefits work by drawing toxins out of the body that can cause a range of symptoms and diseases - including Fatty liver, Acute viral hepatitis, Alcoholic cirrhosis, Chronic active hepatitis, Drug and alcohol-induced liver damage, Cancer development, High cholesterol, Diabetes, Kidney stones, Fibrosis and Cirrhosis, Gallbladder disorders, Environmental sensitivities and toxins, Hepatic toxicity caused by steroid usage, negative effects of chemotherapy, Skin damage and much more. Andrographis Paniculata :- An ancient medicinal herb extensively used in ayurvedic medical system. This plant total extract has yielded number of pharmacologically important molecules - Andrographolides A, B, C and D. It has a bitter principle, chlorophyll, sodium and potassium salts. Andrographis paniculata has been scientifically proved for antibacterial and anti-viral properties (anti-typhoid and anti-influenza). Hepatitis virus A, B, C, D and E can be attenuated with this herb. In infective hepatitis (Jaundice), Andrographis Paniculata along with other ingredients in HEPATITONE synergizes the effect. Andrographis Paniculata augments the bile secretion (bile salts and bile pigments) that enables fat emulsification and better digestion. Another major therapeutic effect includes anti-diabetic, Immunomodulatory and gall bladder functions by bile production. Though insulin is produced in pancreas, the real insulin effect is at the liver. Liver takes up around 50% of insulin for a normal blood sugar maintenance. In type-2 diabetes Andrographis Paniculata has therapeutic value by improving the insulin sensitization and maintaining the liver enzymes. Picrorhiza Kurroa :- It is purely a seasonal Himalayan precious herb. The rhizomes are the used part of Picrorhiza Kurroa in Hepatitone. Its strong alkaloids are powerful liver stimulants. It can help to increase liver enzymes and liver secretions. Picrosides 1, 2 and 3 are the liver protective ingredients. Kudkin is another isolated molecule that also is having hepato-protective action. It is highly bitter in taste. Picrorhizin is another active principle. Other actions are - powerful anti-oxidant activity and immunomodulating effect. Antiulcer effect that is gastric and duodenal ulcers are healed fast with picrorhiza. Again picrorhiza increases bile quality and quantity like andrographis. Antidiabetic is another important effect as the liver is the seat of sugar control as mentioned before. It also has Antibacterial effect against typhoid, bacillary dysentery and E-coli infections. Tinospora Cordifolia :- This creeping important ayurvedic herb is very often known as a liver tonic. The stem is used for formulating HEPATITONE. It is bitter in taste. Tinosporin and berberin are two isolated active principles. Tinosporin is an immunomodulatory agent. It increases the white cell count in pathological states to increase the phagocytosis of the foreign material. This leads to the destruction of microbes in infections. Liver enzymes are positively influenced. It has anti-diabetic (hypoglycemic) actions. Tinospora cardifolia helps to reverse the fatty degeneration of liver. Anti-oxidant, anti-pyretic and anti-inflammatory functions of Tinospora cardifolia is well studied scientifically and documented. Phylanthes Emblica :- Often referred to as Indian gooseberry, is one of the richest known sources of vitamin C (720 mg/100g of fresh pulp or up to 900 mg/100g of pressed juice. )– It contains 30 times the amount found in oranges. The vitamin C in Phylanthes Emblica is bound naturally to protect against destruction by heating, unlike in other fruits. The high content of tannins makes it a first class anti-oxidant. Ellagic acid content in Phylanthes Emblica is very high and so even DNA is well protected from mutation by the free radical oxidation. Stomach mucosa and liver tissue cells are protected from toxins like carbon tetrachloride. This helps regeneration of liver cells. 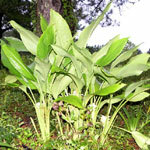 Curcuma Longa :- The Curcumin content of this rhizome is well studied and documented. It is an ancient ayurvedic herb known for its anti-toxic effects. Resins and alkaloids in Curcuma Longa are isolated and its actions are recorded. Liver cells are protected from toxins. Curcuma Longa helps regeneration of hepatocytes with good liver function in cirrhotic and fatty livers. Curcumin is also a well known antioxidant and anti-inflammatory. This is a natural tonic to human brain as it protects neurons from free radical oxidation; hence it can prevent Parkinson and dementia states. I had surgery to remove my gallbladder and the doctor told me that he found that I also had a condition called "fatty liver". I researched on line for ways of curing it but I couldn't find any over the counter medications for this condition. My husband discussed it with one of his friend who had purchased HEPATITONE from Gurus Garden and he strongly recommended that I try it. I also had very high cholesterol and triglycerides, and have been on medication for that for many years. Nothing I took was able to lower those levels. We spoke with the herbalist at Gurus Garden and he recommended HEPATITONE for my fatty liver and VASKO for my cholesterol. I took his advice and ordered. I felt I had nothing to lose because your products are all natural. After 3 months on both of your products in combination, I had a CT scan and new blood work done for my cholesterol levels. Amazingly, my liver was showing as normal and my cholesterollevels had gone down from 293 to 181! To me this a miracle. Nothing has ever worked for me as well as these two products. Thank you so much Gurus Garden. I am overweight and I was recently diagnosed with fatty liver. I have not been able lose any weight for the past several years. I was getting desperate and feeling really sick. After finding Gurus Garden online and speaking to an herbalist , I purchased a 3 month supply of HEPATITONE and a 3 monthsupply of SKINNY SECRET at the same time, as per the advice of your herbalist. After 3 months, lost 18 lbs and overall I felt much healthier. Following that success, I purchased another 3 month supply of both. I then lost another 20 lbs. I feeling more than I had in a very long time. I went for a follow up with my doctor and they did another scan of my liver. The doctor was amazed at the difference since my last scan report. My blood work came back very normal. Honestly, it was hard to believe. I have recommended your products to my friends and family who all notice the difference in me. I even wrote about your products on my Facebook wall. I just feel like I want to "Pay it forward". You helped me, so now I want to help others in return. I am more than happy to recommend your products to anyone that is suffering from fatty liver and being overweight because I know how hard that is. Thank you Gurus Garden. I have been sick for a very long time. I have been diagnosed with numerous health problems, including elevated liver enzymes and Type 2 diabetes. I found Gurus Garden on a Google search and placed an order for HEPATITONE because it seemed to be the right choice for me and my situation. I have been using it now for 4 months and I see a huge difference in my overall health. After a few months , I went back to my doctor for more blood work. The results came back showingmy liver enzyme levels to be greatly improved. I continued with another 3 month supply of your product and when I just did my testing again, my liver enzymes came back as "normal". I was shocked! I have to say that I also noticed that since taking HEPATITONE,my diabetic episodes, are much less frequesnt and all of the symtoms that come with my Diabetes are much more controlled. I would recommend HEPATITONEto anyone with liver problem. There has been nothing else like it for me. Nothing else has helped me the way that this has.